“I feel sorry for you,” Van Heflin tells Barbara Stanwyck near the end of “The Strange Love of Martha Ivers.” It’s not exactly true; Heflin simply intends to hurt her with those words. Nor does it really capture our feelings about Stanwyck more generally. Looking through piles of essays about her, I’m surprised by the number of times writers characterize her by class (references to her Brooklyn accent, and so on) — which are, I think, misguided. I think that what makes her so unsettling onscreen is that she played strivers. No matter their class, she played an array of women marked by their careers, personal sacrifices, neediness, and deceptions — such that she encapsulated moviegoers’ ambivalence toward striving women. “She retained a core of authenticity as unshakable and unmistakable as the Brooklyn vowels that colored her speech,” wrote the New York Times recently on release of a new DVD of six of her films. Maybe I don’t have the ear for it, but she doesn’t sound anything like my working-class, Brooklyn-raised grandmother who was almost exactly Stanwyck’s generation; and it seems to me she took on the roles of spoiled heiresses just as often as she played women on the make. 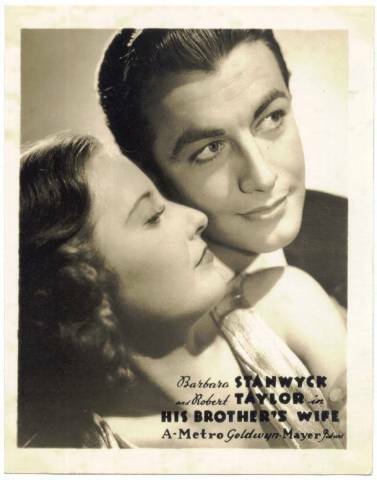 Perhaps Stanwyck put a layer of refinement on top of something more recognizably lowbrow (like “Barbara Stanwyck” on top of her real name, Ruby Stevens). But rather than play would-be Henry Higginses, I think we should focus on two other qualities of her voice: its tendency to sneer (is that really how it sounded, or merely how it looked when her upper lip lifted to emit those insults she hurled at other characters?) and her relatively low register, one that could sharpen into a growl when necessary, but marked a worldliness that other ingénues didn’t have. It only moved up the scale when she played especially despicable roles, such as the hysterically paralyzed Leona Stevenson in “Sorry, Wrong Number”; in such parts she used it to screech or cajole. But it could be used to slippery, buttery effect as well, such as in her brilliant comic turn as a female con artist in “The Lady Eve” in which she plays Henry Fonda for a sap — and falls in love along the way. Take “The Strange Love of Martha Ivers” (1946). Van Heflin plays a man who ran away from Iverstown when he was a kid, the night of the big electrical storm. Little does he know that he just missed witnessing his childhood sweetheart murder her domineering, wealthy aunt in the heat of passion — so when he accidentally shows up in town again, the grown-up Barbara Stanwyck thinks he wants to blackmail her and her weak-willed husband, Kirk Douglas, who helped cover up the crime way back when (in his screen debut, Douglas shows that you could have parked a Buick on his magnificent chin, but he cowers before Stanwyck). By this time she’s the town’s petty royalty: not only has she inherited every penny of her aunt’s estate, she’s increased the family factory to ten times its original size and ensured that Douglas will never face an opponent when he runs for re-election as D.A. When she sits at her desk in the factory, proudly showing Heflin the extent of her business savvy and success, we find ourselves cringing at her almost manly grit and determination, and we worry that he’s going to fall for her again. Is it really Heflin’s silence she wants? Or is he The Man Who Got Away? Yet again, is she primarily interested in pushing the slightly dim-witted Toni (Lizabeth Scott, with the legs above) out of the picture? Her titular “strange love” is, I think, all three of those things — Stanwyck’s Martha Ivers is yet another example for viewers of what women aren’t supposed to be. Yet look at what a bundle of contradictions her steeliness represented: on the one hand Stanwyck was the highest-paid woman in America after 1944, nominated four times for Best Actress, consistently earning top billing throughout her career in the 30s and 40s, and married to one of the screen’s most dreamily beautiful men, Robert Taylor; yet on the other, she played hard women who lose in the end, undone by their grasping attempts to be something more than they are. Who could have held her own in that dialogue with such inscrutable distance other than Stanwyck? I wonder if we’re still dealing with the fallout of a Hollywood deeply ambivalent about women with careers, self-made women, women who want something more than they have — and if this is the reason we still recoil at Stanwyck’s brassy snarl rather than embrace it. I recommend we embrace careerism and reject the narrative that such women lose in the end. Stanwyck did.